The California Science Center's "Endeavour Fest" celebrates the first anniversary of the retired space shuttle's display, Oct. 11-13, 2013. The California Science Center is commemorating the first anniversary of Endeavour's deliveryto its Samuel Oschin Pavilion with a celebration to thank everyone who joined in supporting the shuttle's historic journey. "Endeavour Fest" begins today (Oct. 11) and runs through Sunday with special exhibits and astronaut guest speakers scheduled. Endeavour helped draw in 2.7 million visitors, one million more than the CSC saw the year before, including 21,000 visitors in a single day. Guests also broke the center's all-time attendance records in July and August 2013. "It's been just an incredible surge of visitor interest," said Phillips. "Lots and lots and lots of foreign guests." "We've always had a healthy fraction of our visitors from other countries," he said. "But just the number that we've had, it suggests the orbiter has put southern California on the map as a kind of must-see destination when visiting from other countries." The free, three-day Endeavour Fest includes a number of special features and debuts. In addition to seeing the shuttle itself and other spacecraft that are a part of the California Science Center's existing collection, visitors will encounter a flown SpaceX Dragon spacecraft. The gumdrop-shape craft is an example of the company's commercial uncrewed capsules that NASA has contracted to deliver supplies to the International Space Station. Guests can walk around and under space shuttle Endeavour in its home at the California Science Center. Click here to view a photo gallery. Another capsule, one flown during a record-setting "space jump," will make its west coast premiere during Endeavour Fest. The Red Bull Stratos touring exhibitionfeatures the 3,000-pound (1360-kilogram) vessel and pressure suit that was used by daredevil Felix Baumgartner when he jumped from the stratosphere to become the first human to break the sound barrier during freefall. Baumgartner's leap took place on Oct. 14, 2012, the same day that Endeavour arrived at the science center. Visitors can relive the orbiter's arrival through a new short-form documentary premiering over the weekend. The 20-minute film "Three Nights, Three Days" covers the shuttle Endeavour's 68-hour transport, taking a behind-the-scenes look into the monumental feat of movinga 150,000-pound (68,000-kg) national treasure through urban public streets. NASA had been slated to provide additional exhibits and speakers as part of the weekend's celebration, but the on-going federal government shutdown canceled the agency's participation. 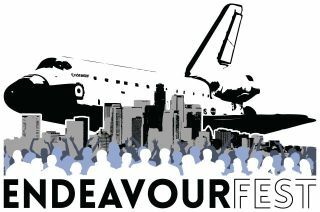 Endeavour Fest will still include however, appearances by retired NASA astronauts. Dan Bursch, Danny Olivas, Hoot Gibson, Story Musgrave, and Garrett Reisman, who each flew missions on board Endeavour, will give presentations and sign autographs for guests. In particular, Olivas will be signing copies of his children's book, "Endeavour's Long Journey," featuring the shuttle's delivery to the CSC one year ago. Slated for a 2018 opening, the center's Samuel Oschin Air and Space Center will display Endeavour vertically, paired with solid rocket boosters and an external fuel tank, as the space shuttle appeared on its launch pad. As part of that exhibit, Endeavour's port, or left side payload bay door will be open, revealing an experiment logistics module inside. "We're preparing, a year from now, to put the Spacehab in the payload bay," Phillips told collectSPACE.com. "We have to figure out how we're going to move the attach hardware in the payload bay to where it needs to be. We have had the crew hatch open [today] and have gone from there through the middeck into the payload bay to get an idea as to what we need." "The next eight months or so will be spent pulling together the ground support equipment and everything we need to execute the opening of the payload bay doors," he added. Endeavour Fest will be held 10 a.m. to 5 p.m. PDT Friday through Sunday (Oct. 11-13) at the CSC's Donald P. Loker Conference Center. Admission is free, though timed entry tickets will be required to visit the Endeavour exhibit. The science center recommends guests make advance online reservations through its website, californiasciencecenter.org, to avoid long lines at the box office.